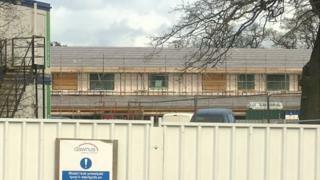 Construction firms in Powys could be hired to build county schools after a contractor went into administration. Swansea-based Dawnus had three projects in Powys, including an English-medium primary school in Welshpool. A new all-ages school in Machynlleth and a conversion to create a Welsh-medium primary school in Welshpool are still at the planning stage. Powys County Council said it would be looking to hire a main contractor with a number of local firms coming forward. The 360-pupil English-medium primary school in Welshpool was due to open in September 2020, while the Grade II-listed Maesydre school building is to be turned into a 150-pupil Welsh-medium primary school. New premises for Ysgol Bro Hyddgen in Machynlleth have also been affected. A council spokesman told the Local Democracy Reporting Service: "The council's priority is to appoint a main contractor to complete the scheme and to make sure that Powys-based contractors are involved. "A number of Powys-based contractors have expressed an interest in taking over the main contracts and the council is carrying out financial and commercial assessments of all those who have expressed an interest." A roofing contractor has already been hired to make sure the partly-built school in Welshpool was weatherproof, he added. Timescales for completion will not be known until a main contractor has been appointed. Plaid Cymru group leader Elwyn Vaughan, vice-chairman of the governors at Bro Hyddgen, has asked the ruling Independent/Conservative cabinet to update the full council on the situation at its next meeting in May. He said he was "aware of obvious delays in Machynlleth" and wanted to know "if any monies were paid up front".